Flyte Systems is the leading provider of cost effective airport travel information. The company delivers displays and digital signage content for the hospitality, corporate training center, digital signage and convention center industries and related businesses. Flyte Systems is a division of Industrial Television Services (ITS), based in Chicago. ITS is a respected digital signage solutions company with more than 50 years of experience specializing in real-time information delivery. 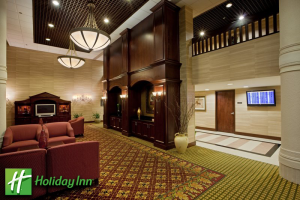 The 297-room Holiday Inn Washington Dulles provides travelers with large comfortable rooms, complimentary Wi-Fi and efficient work desks in each room. The property has renovated most of its guest rooms as part of a $7.2M renovation to add additional amenities and guest services.